Find Better Ideas, Faster ® with a custom hiring trend report, our PRO Dashboard and 80+ categories of premium trend reports. 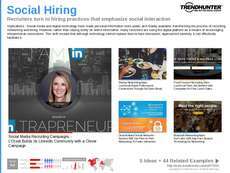 The Hiring Trend Report analyzes a corporate process that has vastly changed with the advent of new technologies. From apps that allow job seekers to rapidly swipe through job postings to algorithms that detect keywords in resumes, the experience of hiring a new employee continues to evolve rapidly. 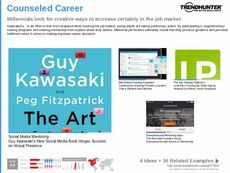 This report covers topics such as attracting and hiring millennial workers, popular job search sites and innovative hiring techniques. Management professionals seeking innovations in the most effective and efficient hiring techniques will find cutting-edge concepts in this report. 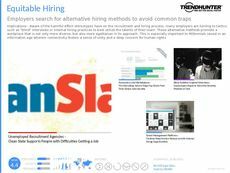 The Hiring Trend Report is also invaluable for developers of job search sites or apps, or members of the marketing industry looking to present the most attractive image of a company to potential employees. 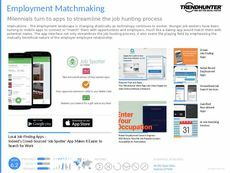 Examining the changing face of the hiring process, this Hiring Trend Report covers innovations in job search sites and apps, techniques for identifying quality employees and attracting and retaining millennial workers.